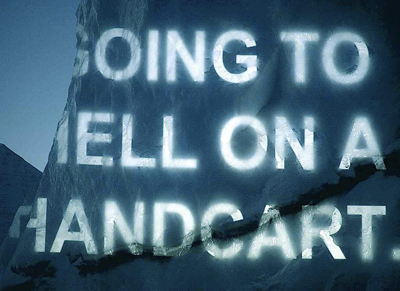 David Buckland, text Amy Balkin, ‘Going to hell on a handcart.’, Ice Art. With each day we move towards a necessary revolution. Resource depletion, mass species extinction and the risk of runaway climate change highlight the great flaws in our current worldview and the society it has built. It is in this nebulous inner realm of intuition and story, that a revolution quietly gathers strength. And it is in this realm that art has a unique power. Its intrinsic nature allows it not only to powerfully mirror ‘the now’, but to inspire and demonstrate a vision of where we can go from here.